Breakfast for dinner is becoming the norm. Restaurants and home cooks everywhere are serving it up in grand style. Pancakes, waffles, French toast, eggs, sausage and bacon are a special treat after a long day, but the world is craving a more sophisticated take on the classics. Bon Appétit recently featured an array of rousing recipes from Chef Yotam Ottolenghi who has a magical way with food. I was inspired by a particular recipe called “Skillet-Baked Eggs with Spinach, Yogurt, and Chili Oil.” I have not stopped thinking about it since reading the article while stuck on a hot, crowded plane a few weeks ago. It whisked me away to a happy place, and I could not wait to get home and see what I could come up with. Ottolenghi’s technique can be found throughout the Green Egg Skillet Bake, but the flavor profile is quite different. It focuses on the richness of cumin and hearty greens which are perfectly highlighted by a liberal dose of red pepper flakes. So, who is making breakfast tonight? In a large heavy pot on medium high heat one tablespoon of olive oil. Add the onions; cook until tender and lightly browned; about 3 minutes. Salt and pepper to taste. Add the collard greens; cook until vibrant green; about 3 minutes. Add the garlic, cumin, oregano, red pepper flakes; stir to combine. Add the spinach and cook until wilted; about 2 minutes. Turn off heat. Coat a medium cast iron skillet with remaining olive oil (or cooking spray to reduce calories). Transfer the mixture to the skillet leaving excess liquids behind. Scatter mushrooms on top. Make four wells in the mixture; gently crack eggs directly in to wells. Bake until the eggs are set; about 7-10 minutes. While the skillet bakes, whisk all of the sauce ingredients together to combine. Present the dish in the skillet, dolloped liberally with sauce and drizzled with good olive oil. Serve piping hot. Serve with toasted multi-grain bread to soak up the yolks. Great one dish breakfast here! I have made things with veggies before and had problems with having too much liquid. This does look like the veggie are sturdy and I am sure the draining after the first cook helps. I will need to try it-we all could use some more veggies for breakfast! Hi Tina! I think the most important thing to do is precook the veggies and leave the liquid behind. It makes the dish sturdy as you said. My husband and I just loved this dish. It was quick too! Wow.. what a beautiful dish and I love your presentation!! Really well done!! Gorgeous recipe!! Thank you. It certainly was fun to make! It's lovely to meet you and your blog as well. Looking forward to following you! I just love the look of this--I was prepared to find out that the gorgeous creamy sauce was horrible for you, but it isn't. Score! It's amazing how absolutely decadent food can taste AND it can still be healthy. Isn't it? It's almost dinner time here and your story about breakfast for dinner is tempting me. I actually haven't done it before but I have to say good breakfast is one of my favorite. This dish is absolutely delicious! I have a weak spot for egg dish and this totally hit my spot. YUM! I'd be happy with this along with toasts or bagels... Oh I wish this is my dinner tonight! This is one of those dishes I could eat for breakfast, lunch or dinner. Glad that I was able to tempt your taste buds! Hopping over now to see what you are up to. I think my hubs would love this one. Great recipe and love that you did it in a cast iron pan. A) LOVE that you mixed the collards and the spinach! B) I am SO over this once my vegan cleanse is over! 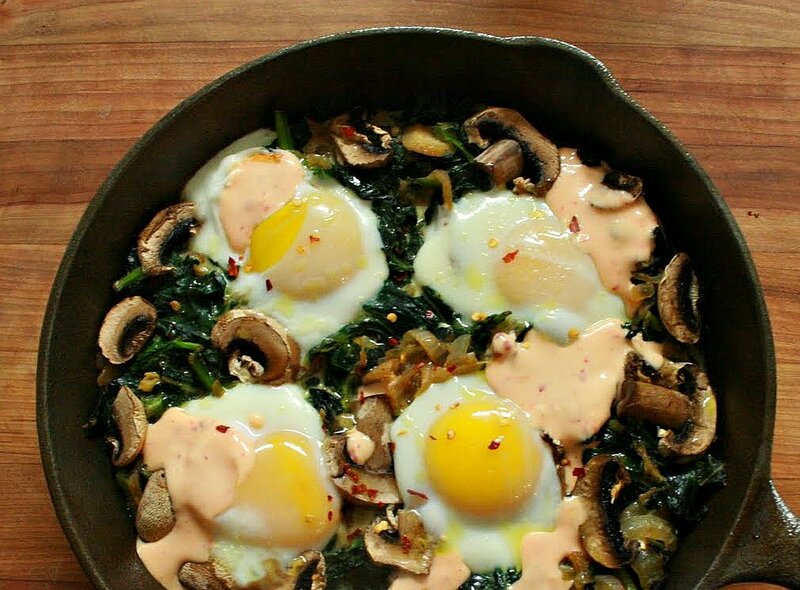 C) LOVE that you called this green egg skillet bake... makes me think of Dr. Seuss, who was from my hometown! Yay for lists! The collards really give this substance, and Dr. Seuss is the man. I would suggest bathing in this sauce. I did the dairy alternative version and my hubby was amazed how good it was. So simple but it really takes this dish to another level. Sounds familiar like what I do, that is breakfast for dinner. I also tend to eat lighter for night meal. That cumin and chilly paste are those I don't miss out when cooking at home because its so much of flavors into the food. Nice pairing with spinach and the yoghurt sauce. Lovely and looks tempting. Omg, those fried eggs. My weakness. Looks so good! This looks so good. I love breakfast food for lunch or dinner. What a stunning breakfast! You've reminded me I need to order Ottolenghi’s book. This really is 5 star and I think you've done it justice with that gorgeous photo. I have a serious foodie crush on Ottolenghi, mostly based on the recipes and photos in Plenty. Maybe someday I'll get to visit London and eat in his restaurant, but this dish sounds like the next best thing. Thank you! I also have a crush on him after that article. I will check out Plenty. If I ever get to London he will be at the top of my list. Happy sigh. I love the idea of breakfast for dinner..Your dish look fantastic and I can imagine the flavor..yummy! Oh, my...this looks AMAZING! I love breakfast for dinner and you just took it to a whole new level! Thanks! This is one of my favs as of late. This is the 2nd day in a row I've made this...so delicious! I used kale instead of the other greens, as that's what I had, and they turned out amazing! So good! I'm so happy you like it! It's one of my favorites as well. Any heart green really work well in this dish.